Cherries grow on trees, strawberries on vines, but how do cashews grow? Thanks to our current food system, we can get crops from almost anywhere in the world—vanilla from Madagascar, bananas from Ecuador. Of course, the downside of receiving produce from far-off lands is that we can't exactly run into the fields to see how they're grown. For many, the manner in which fruits and veggies emerge from the earth can be something of a mystery. 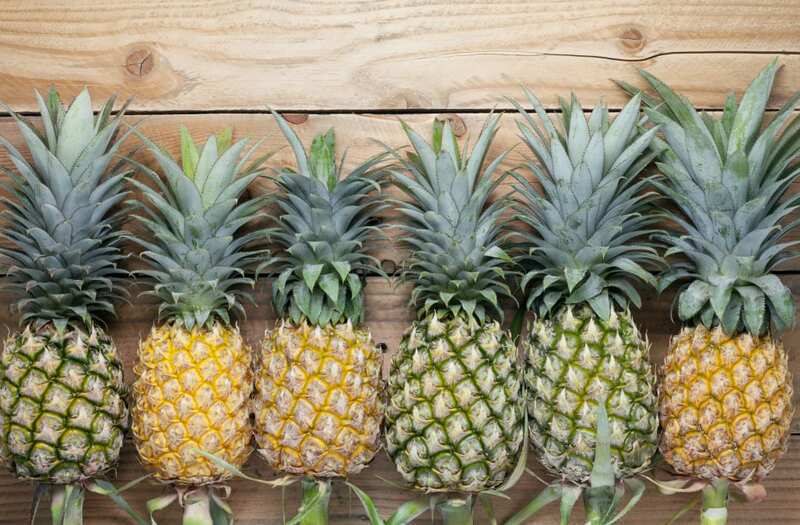 While many people think that pineapples grow on trees, this fruit is actually an herbaceous perennial with soft, palm-like leaves and no woody stem. In fact, the pineapple is in the same family as air plants. The fruit grows out of the center of the plant, but only once it's old enough to flower—a process that takes two to three years. If that isn’t suitably weird, how about this: pineapples are berries (coalesced or cluster berries, to be specific). Chocolate comes from the seeds of the fruit of the Theobroma cacao tree—the leathery cocoa pod pictured here. But you don’t just grind up the seeds to make chocolate. They have to be roasted and fermented first. Vanilla is the edible fruit of an orchid. Although vanilla is now grown in many regions around the world—most notably Madagascar—the bee that can naturally pollinate vanilla is only found in Mexico and Central America. Everywhere else in the world that vanilla grows, it must be hand pollinated which is one reason why vanilla is so expensive. Each stalk of asparagus emerges from the ground like a skinny little green tree. It's a perennial plant, meaning it grows back year after year even when you cut it (if the conditions are right). If you let it go too long, the top of the asparagus will flower. As it gets taller it develops surrounding leaves that are quite fern-like. Eventually the plant will even produce tiny red berries—but they're toxic. Cashews grow on trees. That's not too shocking. But the particulars throw a lot of people for a loop: the cashew nut is encased in a shell at the base of the cashew fruit, commonly called the cashew apple. In many of the countries where cashews are grown, the "apple" is turned into jellies, drinks, and sometimes even distilled into liquor. Peanuts are legumes—not nuts—which puts them in the same grouping as kidney and lima beans. Nothing brings that message home quite like this freaky image of them freshly dug from the ground, growing all bean-like. Like chocolate, coffee comes from a seed. In this case, the seeds are encased in a brightly colored, cherry-like fruit often called (for obvious reasons) coffee cherry. The fruit itself grows on a plant that’s best described as a bush or a small tree. Coffea arabica is the varietal that accounts for most of the world’s production, while Coffea canephora (also called Coffea robusta) accounts for the rest. In the west we mostly ignore the fruit that surrounds the coffee seed, but it can be brewed into a tea. Artichokes are in the same family as thistles—we're eating the flower before it’s bloomed. Consequently, it just hangs out on a stalk in the middle of a cluster of smaller flowers. A rational person might think that chickpeas, like regular peas, grow in a pod with multiple seeds. A rational person would be wrong. They do grow in pods, but only one chickpea is inside each one—so these legumes have a distinct appearance as they grow. Like artichokes, capers are actually edible flower buds (usually eaten pickled), picked well before they bloom. The buds pictured here are past their picking prime. Brussels sprouts are edible buds, and are part of the same species as cabbages (Brassica oleracea) which almost explains why they grow on a fibrous stalk that looks like someone stuck a cabbage on top. What a world. Brassica oleracea is a species with over a dozen cultivars—varieties bred to grow into plants that seem wildly different from one another. You might not be surprised to learn that cauliflower and broccoli are actually the same species, but did you know that these plants also share their DNA with brussels sprouts, kale, kohlrabi, and those weird decorative cabbages that grow at the mall? Wild.